The building of the Prora Youth Hostel has had an eventful past. Yet it couldn't be better positioned: right next to the beautiful and wide sandy beach of the Island of Rügen. Prora is situated just outside of Binz, one of Germany's most popular Baltic Sea beach resorts. 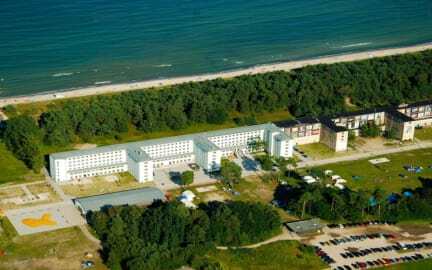 Here in Prora, the world's longest Youth Hostel has just been expanded and given a face-lift. It is modern, relaxed and multi-cultural. This is where you can hear the sound of the sea and meet like-minded people from all over the world who love the Hostel's motto on the beach: 'turning grey into colour'. The campsite in Prora is just as colourful as its guests, and is the perfect place to have beach parties and get a 'summer group feeling'. We have 424 beds in rooms with two to six beds, mostly equipped with en-suite shower/toilet, 11 group and day rooms, 16 rooms with wheelchair access, space for 250 to camp. The reading corner, playroom and fairground are perfectly suited for families. Or you can cosy around the bonfire or barbecue. The cafeteria's perfect for chilling out after having done sport or played games at the beach. The hostel is open from 24.03. until 31.10. Reception times are from 07:00 - 22:00 daily. 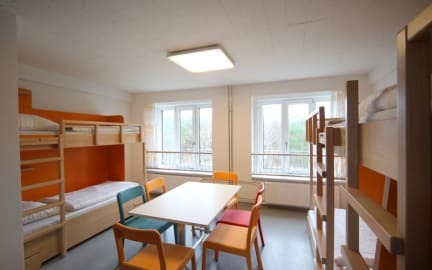 To stay in the DJH Jugendherberge Prora, you must be a member of the German Youth Hostel Association or the Youth Hostel Association Hostelling International (HI). A Membership can be purchased on arrival at the property.